First up to join an already mind-blowing array of headliners will be former Swedish House Mafia kingpin and quite literally one of the biggest DJs on the planet, Sebastian Ingrosso! Making his much-needed Ultra Europe debut, the Refune label boss will be taking to the mighty main stage to wow the hoards of fans heading to the largest dance music festival in Croatia's history this July. If that weren't enough, Ultra Europe has also confirmed Subliminal head honcho and long-standing veteran of the US house music scene, Erick Morillo, as the final headliner to be announced in the Ultra Worldwide Arena. Following Disclosure, Pretty Lights, Gramatik, Paul Kalkbrenner and Hot Since 82 who will lead proceedings on Friday 11th July, Morillo will be making his Ultra Europe debut on Saturday 12th, joining the king, Carl Cox, and the likes of Marco Carola, Nic Fancuilli and RioTGeaR for an epic Carl Cox & Friends showdown. 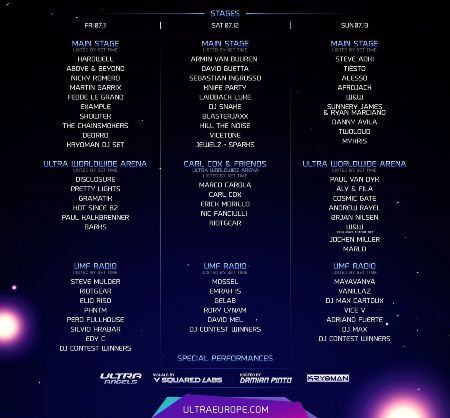 Ultra Worldwide will then be transformed into a trance haven on Sunday 13th, with sets from the likes of Paul Van Dyk, Cosmic Gate, W&W and Aly & Fila amongst others. Taking place over three huge days in Split this year (formerly two days), Ultra Europe will also be welcoming UK underground house legend Hot Since 82, French trap don DJ Snake, New York-based dubstep superstar Kill The Noise, prog-house mainstay Vicetone and tech house wizard Nic Fancuilli to the proceedings. 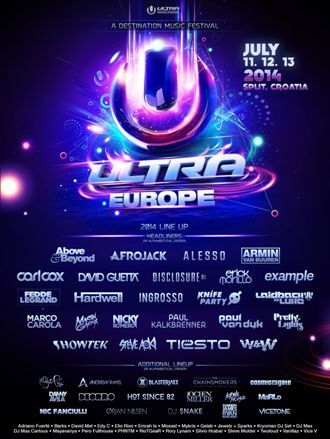 Following a historic, sold out debut edition in 2013, in which over 103,000 sun seekers flocked to Croatia's idyllic Dalmatian coast from more than 75 countries worldwide, the excitement for Ultra Europe's second annual installment is now reaching fever pitch. With only extremely limited tickets remaining for what is set to be one of the biggest highlights of the European festival calendar this summer, be sure to act now to avoid disappointment. Acts for Ultra Europe's exclusive 5000-capacity event at the Hotel Amfora Grand Beach Resort on Hvar on Tuesday 15th July have yet to be announced. All Advance General Admission Tickets for this ultimate pool party have now SOLD OUT, but Accommodation Packages including event tickets are still available from www.travel2ultra.com.